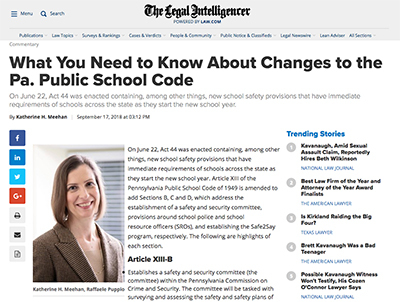 Raffaele Puppio partner and education attorney Katherine Meehan authored an article about Act 44 and the changes it brings to the Pennsylvania Public School Code. Act 44 was enacted on June 22, and contains new school safety provisions that have immediate requirements of schools across the state as they start the new school year. To learn more about how your school district may be affected, read the full article here.